I’m not jumping ship from United, but I am starting off 2018 flying a whole lot of oneworld. That trip began with a redeye on American Airlines’ last night from LAX to JFK. If you caught my AA medical emergency post yesterday, you’ll recall that my flight had to turn around just prior to takeoff due to a sick passenger. More details on that here. I chose AA because I get tired of the long Uber ride or NJ Transit / LIRR / AirTrain connection between Newark and Kennedy. Not only did I score a cheap ticket, but I did not even have to go through security for my onward connection to Doha last night. To some extent, economy class is always economy class. 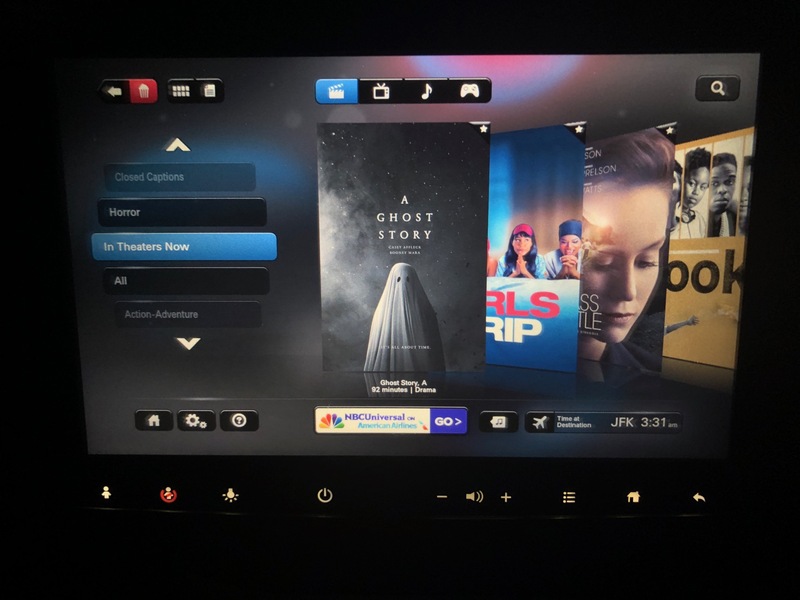 But this was AA’s premium transcontinental product and I was interested to see how it compared to my redeye in United economy class last month. Specifically, when it came to meal service. Legroom was tight…I was in a regular legroom seat on American with 31″ of seat pitch and when my neighbor in front reclined, it was quite cramped. But AA offers better blankets than United and I brought a neck pillow along (how geeky does that make me?). With our delay, I had the chance to watch an odd movie called A Ghost Story and play some solitaire. I know airlines are opting for streaming video instead of seatback monitors, but I still appreciate them. After takeoff, a light complimentary meal was offered. Passengers were given three choices: a chicken wrap, vegetarian warp, or fruit and cheese plate. Although I was inclined to choose the chicken wrap to compare it directly to United’s, it just sounded too heavy…especially when it came with potato chips and cookies on the side instead of fruit and brownie (on United). I chose the fruit and cheese plate instead, which is identical to what AA sells for $8.99 on non- transcon prices. It was excellent. Very refreshing and helped me to fall asleep after. Thanks to the delay in Los Angeles, we landed in New York about an hour late. My first flight in 2018: medical emergency + late arrival + economy. What kind of a year will this be? I don’t know, but I am looking forward to it! It’s amazing what a difference the extra legroom in E+ makes. An that makes it very hard for me to fly anyone else now I have UA status. I guess the same must be true for those with status on Delta and AA as well? I know that I could buy up to extra legroom but that can be pretty expensive (for my budget) on longer flights. I, too, appreciate built-in IFE. Right now I don’t even own a laptop or an iPad (I find that I own these things in phases of life. I somehow end up giving them away…), so my only other option would be my phone. It’s nice to be able to have the screen in the appropriate position, and to have your tray table available for other things. I’ve done several redeyes in Main Cabin Extra on these aircraft, and it’s one of the main things that keeps me going back to AA. As a Platinum, I get to choose these seats at purchase, and while I’ve been tempted to jump ship to UA or DL, I am reluctant to do DL especially because I wouldn’t be able to pick comfort + seats at booking… Do others have experience with how frequent/easy Comfort + is to snag as a mid-level elite in practice?